Almere is one of the youngest cities in the Netherlands: the first house was finished in 1976, and Almere became a municipality in 1984. It is the largest municipality in Flevoland with 195.019 citizens (1 November 2012), and the 8th largest in the Netherlands. An evening out in Almere means you’ll be spoiled for choice. The various districts offer something for everyone, whether it be theatre, dinner, dancing, or cinema. The most fashionable locations in Almere Stad are Grote Markt (picture) and Deventerpad, offering restaurants, clubs and bars. 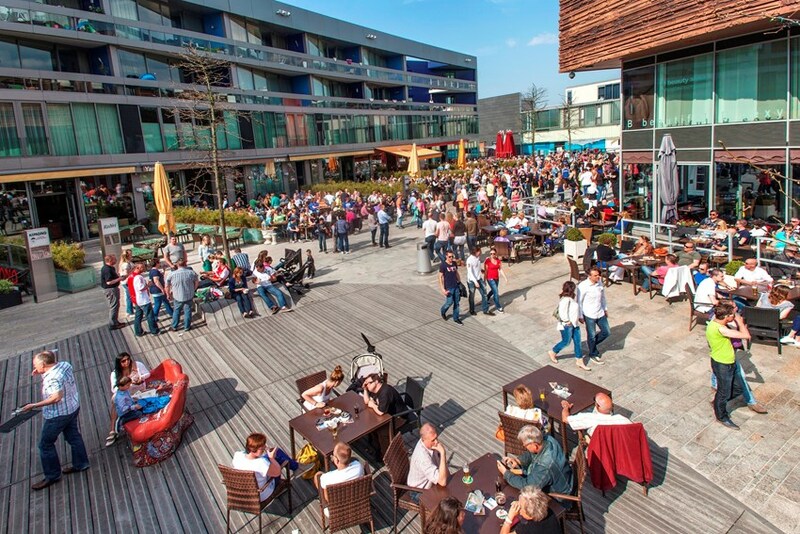 The harbour docks in Almere Haven will entice you to linger over a glass of wine in a delightful ambience. There are many excellent dining locations to choose from throughout Almere. Utopolis is the only cinema with digital projection technology. Almere has various shopping centres to choose from. The new city center the largest shopping district in Almere, is the ideal place to spend the day browsing for fashion, home accessories and much more. There are smaller shopping centres in Almere Haven and Almere Buiten, each with supermarkets and a variety of smaller shops. Almere offers a multitude of sporting activities. There are three indoor swimming pools located in Stad, Haven and Buiten. There are seven sports centres, four sport halls, seven tennis and sport parks, four marinas, three riding stables and a golf course. Almere has gained national repute both at recreational and professional level thanks to such events as the Holland Triathlon. Amsterdam is the colorful capital of the Netherlands. A cosmopolitan city which doesn't bore easily. The historic canals, picturesque (and often ancient) buildings, the many museums, shopping streets and alleys, markets galore, the amazing nightlife : Amsterdam is simply fascinating! It's this character of the city which makes it so unique and which is best felt during a walking tour or a boat trip along the canals. Most of the places of interest are within walking distance. Attractions include the historic canals, the flower market, the old merchant houses, the National Museum with Rembrandt masterpieces, the Van Gogh Museum, the Anne Frank House and Madame Tussaud's waxworks. The Leidseplein and Rembrandtplein squares are the perfect places to relax at one of the many pavement café's. The Amsterdam ArenA, home of AFC Ajax, is one of the largest multi-functional stadiums in Europe and is located in Amsterdam Southeast. It is the heart of a new district with a cinema multiplex, the Heineken Music Hall, the megastores, café's and restaurants. The Amsterdam ArenA is known for its remarkable and revolutionary technology with its sliding roof. This makes the ArenA not just a great football stadium, but also a perfect location for super large events and concerts. The Amsterdam ArenA has hosted many top artists and bands like David Bowie, Robbie Williams and the Rolling Stones. You can visit the Amsterdam ArenA and enjoy a tour full of impressions, things-worth-knowing and of course unforgettable highlights from AFC Ajax. The Dam is the very centre and heart of Amsterdam, although there are arguably prettier sights in the city. As an historical site however, it is fascinating and worth taking the time to appreciate. The Dam has seen many historical dramas unfold over the years, and was for example, the reception area for Napoleon and his troops during the 1808 take-over of the city. The impressive history of the square is well documented in the Amsterdam Historical Museum. The Royal Palace (Koninklijk Paleis) which dominates the square, was originally used as the town hall and its classical facade and fine sculptures were intended to glorify the city of Amsterdam and its government. In contrast to its turbulent history, the square is now a peaceful place and is home to hundreds of pigeons and tourists resting their tired feet. Once a working class area, Amsterdam’s Jordaan has become greatly sought after. The converted warehouses are especially popular, and the Jordaan is now inhabited by a colorful mixture of students, well-to-do businessmen and creative professionals. The Jordaan oozes atmosphere with its narrow streets, picturesque canals, brown cafes, art galleries and unique shops. You can easily lose yourself in a pleasant stroll in through the enchanting streets that connect the 3 main canals.